I think there is a scary connation that comes with being alone. With thoughts of being alone come thoughts of emptiness and unhappiness. It's terrifying to some. Hell, it used to be terrifying to me. I'd constantly call up friends just to come over and watch reruns or join me out at the bars. Sure, there came some good memories out of those nights, but they all became so redundant and blurred together. Loneliness is the worst after a breakup, failing at something, or losing friends. It's this lingering feeling that just pulls and pulls at you until you can't take it anymore. You need a distraction. You need a getaway, and another person serves as the perfect vessel. You get to vent about your issues, and hear about theirs. You get to down a few glasses of wine and not feel like you have a drinking problem because you are in company. You get to feel worth again because someone is spending time with you. 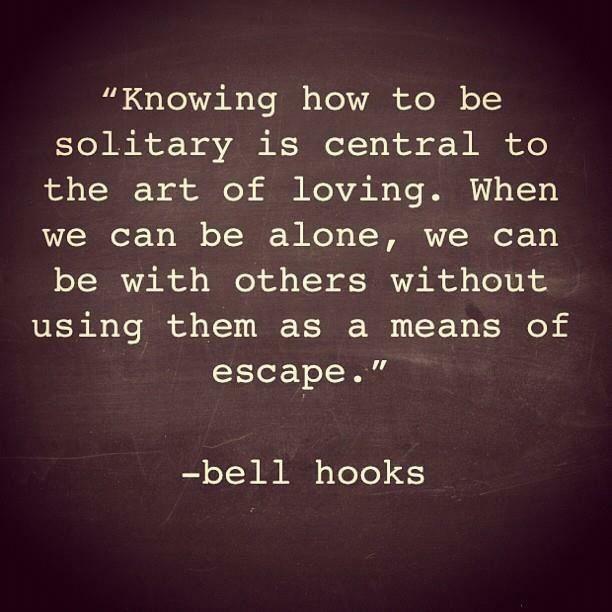 Last year, I came to the realization that being alone isn't the same as loneliness. It's an art. It's a blessing. It's necessary. I don't know when I realized it. It could have been losing interest in the night life, old friends, and old habits. It could have been a breakup that left me reeling for whatever reason. Hello, the relationship was three months old. It was laughable. Whatever it was, I found comfort in solace. I was free to do what I wanted to do. I was free to be healthy and free from hangovers. I was free to walk around my apartment naked and sipping on coffee. I was free to cook what I wanted. I was free to practice the hobbies I had forgotten in all the bustle. I was free to not care about gossip and drama. I was free to go to the movie that I wanted to see, and eat my own popcorn without another hand blocking the perfect, buttery pieces. When you're alone, you build a relationship with yourself. It's one you can only form when you are on your own. In those moments you find yourself. You love yourself. You become yourself. When this relationship is at its strongest, you are able to build healthy, loving, and successful relationships with others. You don't lean on people you don't really need just because they fill a void for the moment. You find people who fit your life because you want them to. The exact same thing happened to me during college. It is so helpful and freeing. But you can't let yourself get so used to it that you don't feel comfortable going out and meeting people anymore. Or just don't really care to...that's where I'm at haha but it's still so invaluable to have time to relax do the things you love.